Sea ice is frozen seawater that floats on the ocean surface. Blanketing millions of square kilometers, sea ice forms and melts with the polar seasons, affecting both human activity and biological habitat. In the Arctic, some sea ice persists year after year, whereas almost all Southern Ocean or Antarctic sea ice is "seasonal ice," meaning it melts away and reforms annually. While both Arctic and Antarctic ice are of vital importance to the marine mammals and birds for which they are habitats, sea ice in the Arctic appears to play a more crucial role in regulating climate. Because they are composed of ice originating from glaciers, icebergs and ice shelves are not considered sea ice. Most of the icebergs infesting North Atlantic shipping lanes originate from Greenland glaciers. Visit Larsen Ice Shelf Breakup Events for information on icebergs in the Southern Ocean. Sea ice regulates exchanges of heat, moisture and salinity in the polar oceans. It insulates the relatively warm ocean water from the cold polar atmosphere except where cracks, or leads, in the ice allow exchange of heat and water vapor from ocean to atmosphere in winter. The number of leads determines where and how much heat and water are lost to the atmosphere, which may affect local cloud cover and precipitation. The seasonal sea ice cycle affects both human activities and biological habitats. For example, companies shipping raw materials such as oil or coal out of the Arctic must work quickly during periods of low ice concentration, navigating their ships towards openings in the ice and away from treacherous multiyear ice that has accumulated over several years. Many Arctic mammals, such as polar bears, seals, and walruses, depend on the sea ice for their habitat. These species hunt, feed, and breed on the ice. Studies of polar bear populations indicate that declining sea ice is likely to decrease polar bear numbers, perhaps substantially (Stirling and Parkinson 2006). Ice thickness, its spatial extent, and the fraction of open water within the ice pack can vary rapidly and profoundly in response to weather and climate. Sea ice typically covers about 14 to 16 million square kilometers in late winter in the Arctic and 17 to 20 million square kilometers in the Antarctic Southern Ocean. On average, the seasonal decrease is much larger in the Antarctic, with only about 2 to 4 million square kilometers remaining at summer's end, compared to approximately 7 million square kilometers in the Arctic. Over the past 10 years, Arctic minima have been only 3.5 to 5 million square kilometers. These maps provide examples of late winter and late summer ice cover in the two hemispheres. NASA launched the Scanning Multichannel Microwave Radiometer (SMMR) in 1978, and the Defense Meteorological Satellite Program (DMSP) launched the first of the Special Sensor Microwave/Imager (SSM/I) sensors in 1987. Scientists at the Goddard Space Flight Center have combined the SMMR and SSM/I data sets to provide a time series of sea ice data spanning over 30 years. For related data sets at NSIDC, visit Nimbus-7 SMMR Polar Gridded Radiances and Sea Ice Concentrations, DMSP SSM/I Daily Polar Gridded Brightness Temperatures, and Sea Ice Concentrations from Nimbus-7 SMMR and DMSP SSM/I Passive Microwave Data. The National Snow and Ice Data Center (NSIDC) also archives and distributes daily sea ice data products from the Advanced Microwave Scanning Radiometer - Earth Observing System (AMSR-E) sensor on NASA's Aqua satellite. AMSR-E was launched in May of 2002 and ceased operations in December 2011. For related data at NSIDC, visit AMSR-E/Aqua Data at NSIDC. The Advanced Microwave Scanning Radiometer 2 (AMSR2) continues the observation record of the Aqua/AMSR-E instrument. AMSR2 launched onboard the Global Change Observation Mission 1st - Water "SHIZUKU" (GCOM-W1) satellite in May 2012. Sea ice climatologies: Arctic and Antarctic sea ice concentration climatology from 1981-2010, at the approximate seasonal maximum and minimum levels based on passive microwave satellite data. Image provided by National Snow and Ice Data Center, University of Colorado, Boulder. Passive microwave satellite data represent the best method to monitor sea ice because of the ability to show data through most clouds and during darkness. Passive microwave data allow scientists to monitor the interannual variations and trends in sea ice cover. Observations of polar oceans derived from these instruments are essential for tracking the ice edge, estimating sea ice concentrations, and classifying sea ice types. In addition to the practical use of this information for shipping and transport, these data add to the meteorological knowledge base required for better understanding climate. The SMMR and SSM/I data sets reveal considerable regional, seasonal, and inter-annual variability in ice cover. Grids of sea ice concentrations, as well as summaries using data from both SMMR and SSM/I depicting annual cycles of ice extent (all areas with at least 15 percent ice cover), ice covered area (the ocean area actually covered by ice), and departures from the monthly means or anomalies are available from NSIDC via ftp. Passive microwave satellite data reveal that, since 1979, winter Arctic ice extent has decreased about 3 percent per decade relative to the 1981-2010 average (Cavalieri and Parkinson 2012). Antarctic ice extent has a small increasing trend in all months (Parkinson and Cavalieri 2012), but the Antarctic is more notable for its high variability. After setting record-high maximum extents each September from 2012 through 2014, the Antarctic had low maximum extents during September 2016, 2017 and 2018. Satellite data from the SMMR and SSM/I instruments have been combined with earlier observations from ice charts and other sources to yield a time series of Arctic ice extent from the early 1900s onward. While the pre-satellite records are not as reliable, their trends are in good general agreement with the satellite record and indicate that Arctic sea ice extent has been declining since at least the early 1950s. Mean sea ice anomalies, 1953-2018: Sea ice extent departures from monthly means for the Northern Hemisphere. For January 1953 through December 1979, data have been obtained from the UK Hadley Centre and are based on operational ice charts and other sources. For January 1979 present, data are derived from passive microwave satellite sensors. Image by Walt Meier and Julienne Stroeve, National Snow and Ice Data Center, University of Colorado, Boulder. In recent years, satellite data have indicated an even more dramatic reduction in regional ice cover. September Average Extents, 2002-2018: Calculated by Walt Meier and Julienne Stroeve, National Snow and Ice Data Center. All values in this table estimated based on the NSIDC Sea Ice Index Version 3. Note that these figures show September average extents rather than minimum extents. The Arctic sea ice September minimum extent reached a new record low in 2012 of 3.41 million square kilometers, 44 percent below the 1981-2010 average, and 16 percent below the previous record in 2007. Since 2002, a new record has been set four times (2002, 2005, 2007, and 2012) and several other years have experienced near-record lows. On September 10, 2016, Arctic sea ice extent dipped to 4.14 million square kilometers, reaching a statistical tie with the 2007 minimum for second-lowest in the satellite record. In 2017 and 2018, extents were higher but still below the 1981-2010 average. The 12 lowest September ice extents over the satellite record have all occurred since 2007. The spring and summer weather conditions play an important role in the minimum extent and the spatial distribution of ice at the end of summer, and help determine if a particular year will be a record low. For example, in 2007, persistent winds through the summer helped to contract the ice to a new minimum record. In 2012, conditions were less favorable to ice retreat through the summer, although a strong cyclone in early August helped break up the ice and enhance melt. Regardless of weather patterns, the Arctic September ice extent shows a consistent downward trend in extent and thickness over the satellite record. Arctic sea ice extents, 1979-2016: This animation shows Arctic sea ice extent from 1979 through September 13, 2016. The black line is the 1981 to 2010 average, and the gray band around it shows ± 2 standard deviations for the same period. Yearly extents are color-coded by decade: 1979 to 1989 (green), 1990s (blue-purple), 2000s (blue), and 2010s (pink). This animation is adapted from NSIDC’s Charctic interactive sea ice graph. 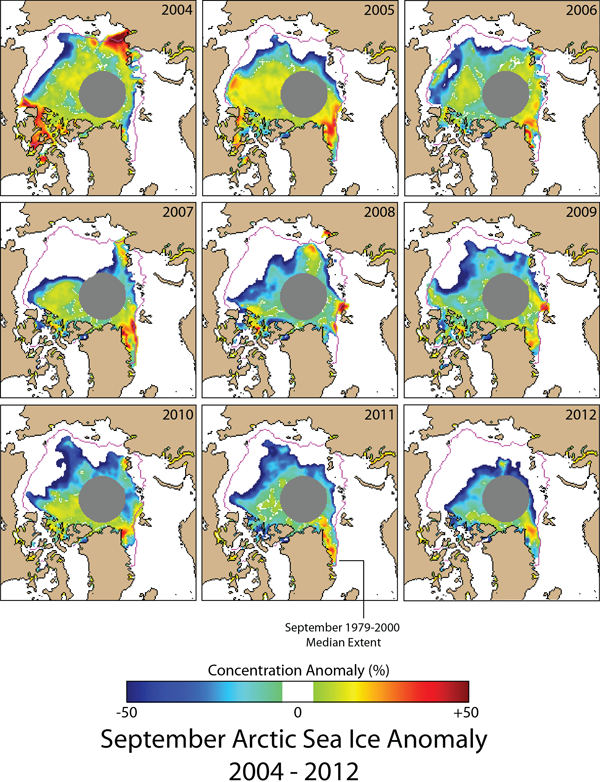 Extent anomaly maps, 2004-2012: Sea ice conditions for the month of September, 2004 through 2012, derived from the NSIDC Sea Ice Index. Each image shows the concentration anomaly (see color key) and the 1979-2000 mean September ice edge (pink line). Nearly every year, the ice edge is well north of its mean position off the coasts of Alaska and Siberia. Image provided by National Snow and Ice Data Center, University of Colorado, Boulder. Combined with record low summertime extent, Arctic sea ice exhibited a new pattern of poor winter recovery. In the past, a low-ice year would be followed by a rebound to near-normal conditions, but 2002 was followed by two more low-ice years, both of which almost matched the 2002 record (see Arctic Sea Ice Decline Continues). Although wintertime recovery of Arctic sea ice improved somewhat after 2006, wintertime extents remained below the long-term average. In 2015, 2016, and 2017, Arctic sea ice set three consecutive record lows for its wintertime maximum extent. In 2018, Arctic sea ice maximum extent was the second lowest in the satellite record. Arctic and Antarctic extents, 1979-2017: In early 2017, the Arctic sea ice maximum extent was the lowest on record. At the same time, the Antarctic minimum extent was the lowest on record, though the Antarctic had not shown a clear declining trend over time. Image adapted by Climate.gov from NSIDC's Charctic. 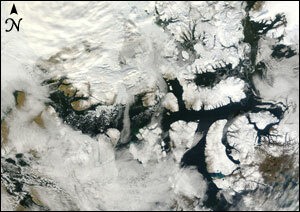 Northwest Passage, September 2007: The summer of 2007 saw the opening of the Northwest Passage. Navigated with great difficulty between 1903 and 1906, the passage opened to standard ocean-going vessels a century later. On September 15, 2007, the same time Arctic sea ice reached its record low, the Moderate Resolution Imaging Spectroradiometer (MODIS) on NASA's Terra satellite captured this relatively cloud-free image of the open passage. In September 2016, Climate.gov reported that the southern route of the Northwest Passage was navigable in the summer nearly every year since 2007, and the northern route was open in 2007, 2008, 2010, 2011, 2012, 2015, and 2016. Image courtesy Jeff Schmaltz, MODIS Rapid Response Team, NASA GSFC. Northwest Passage: The maroon line marks the route of the Northwest Passage that opened up in 2007. Image courtesy University of Bremen. 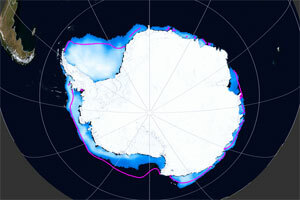 Antarctic sea ice has grown 1.1 percent per decade. The ice growth results from a combination of winds and ocean circulation. Several recent studies have linked sea ice trends in Antarctica to changes in the Pacific Ocean (Stammerjohn et al. 2012, Stammerjohn et al. 2015, and Meehl et al. 2016). Arctic and Antarctic Sea Ice Extent Anomalies, 1979-2017: Arctic sea ice extent underwent a strong decline from 1979 to 2012, but Antarctic sea ice underwent a slight increase, although some regions of the Antarctic experienced strong declining trends in sea ice extent. Thick lines indicate 12-month running means, and thin lines indicate monthly anomalies. 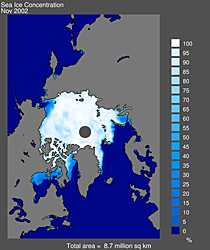 See the Arctic Sea Ice FAQ for more information. Image provided by National Snow and Ice Data Center, University of Colorado, Boulder. 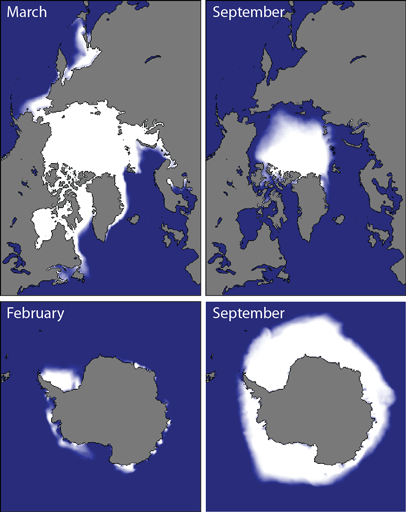 NSIDC provides animations of Arctic and Antarctic sea ice extents and concentrations. Arctic: View extent and concentration images. Antarctic: View extent and concentration images. Sea ice thickness likewise showed substantial decline in the latter half of the 20th century (Rothrock et al. 1999). Using data from submarine cruises, Rothrock and collaborators determined that the mean ice draft (the ice extending below the water surface) at the end of the melt season in the Arctic decreased by about 1.3 meters between the 1950s and the 1990s. A 2009 study examined sea ice thickness records from submarines and ICESat observations from 1958 to 2008 (Kwok and Rothrock 2009). Examining 42 years of submarine records (1958 to 2000), and a five years of ICESat records (2003 to 2008), the authors determined that mean Arctic sea ice thickness declined from 3.64 meters in 1980 to 1.89 meters in 2008—a decline of 1.75 meters. A study published in 2013 compared sea ice volume between two periods: 2003-2008 and 2010-2012. 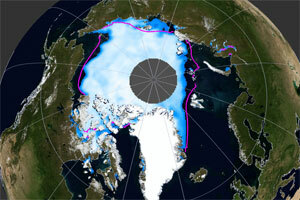 The researchers used data from ICESat, the Pan-Arctic Ice-Ocean Modelling and Assimilation System (PIOMAS) and the European Space Agency CryoSat-2 mission, and found that sea ice volume declined by 4,291 cubic kilometers at the end of summer, and 1,479 cubic kilometers at the end of winter (Laxon et al. 2013). CryoSat-2 continues to monitor sea ice thickness as researchers refine study methods (Ricker et al. 2014 and Kwok and Cunningham 2015). Arctic Sea Ice Thickness Comparisons: These graphs from Kwok and Rothrock 2009 compare sea ice thickness observations from submarine records and ICESat observations over time. The bar chart (left) compares sea ice thickness for six Arctic regions. The time series (right) shows submarine sonar measurements compiled in studies published 2008 and 2009 (designated as RA), and ICESat observations. Error bars on the February-March measurements appear as vertical blue bars. Arctic Sea Ice Thickness from ICESat and CryoSat-2: The maps show Arctic sea ice thickness at the end of the winter melt season: 2004 through 2008 from ICESat, and 2011 through 2014 from CryoSat-2. The graph shows trends in sea ice thickness in winter and summer. Image courtesy Ron Kwok, Jet Propulsion Laboratory, adapted from Kwok and Cunningham 2015. CryoSat-2 thickness and uncertainty estimates: Estimated thickness maps appear on the left and corresponding uncertainties appear on the right. Image from Ricker et al. 2014. Sea ice thickness and sea ice age are not the same thing, but sea ice age provides a proxy for thickness. A study published in 2007 found a dramatic change in the age of sea ice in the central Arctic Basin since the mid-1980s. In 1987, 57 percent of the ice pack was at least five years old, and a quarter of that ice was at least nine years old. By 2007, only 7 percent of the ice pack was at least five years old, and virtually none of the ice was at least nine years old (Maslanik et al, 2007). Multiyear ice coverage actually increased between March 2013 and March 2014, thanks to more ice surviving the summer melt season than had survived in the record-breaking summer of 2012. But overall, multiyear sea ice continues to decline in the Arctic (Perovich et al. 2014). Old v. new ice in Arctic, March 1990 and 2016: These maps show sea ice age of late March 1990 (left) and 2016 (right), around the time of the winter maximum. Younger, thinner ice appears in shades of blue; older, thicker ice appears in shades of pale green and white. Ice-free ocean water is dark gray, and land areas are light gray. Image courtesy NOAA Climate.gov. Ever wonder how the ice edge position in the Beaufort Sea last summer compares to its position this summer? Need to know the total area covered by ice last April? Sea Ice Index images showing monthly mean Arctic and Antarctic ice concentration and extent, along with trends and anomalies in concentration and extent based on satellite passive microwave data. MASIE (Multisensor Analyzed Sea Ice Extent) shows where Arctic sea ice is now, based on multiple sources. Greenhouse gases emitted through human activities and the resulting increase in global mean temperatures are the most likely underlying cause of the sea ice decline, but the direct cause is a complicated combination of factors resulting from the warming, and from climate variability. The Arctic Oscillation (AO) is a see-saw pattern of alternating atmospheric pressure at polar and mid-latitudes. The positive phase produces a strong polar vortex, with the mid-latitude jet stream shifted northward. The negative phase produces the opposite conditions. From the 1950s to the 1980s, the AO flipped between positive and negative phases, but it entered a strong positive pattern between 1989 and 1995. So the acceleration in the sea ice decline since the mid 1990s may have been partly triggered by the strongly positive AO mode during the preceding years (Rigor et al. 2002 and Rigor and Wallace 2004) that flushed older, thicker ice out of the Arctic, but other factors also played a role. The longevity of ice in the Beaufort Gyre has changed as a result of warming along the Alaskan and Siberian coasts. In the past, sea ice in this gyre could remain in the Arctic for many years, thickening over time. Beginning in the late 1990s, sea ice began melting in the southern arm of the gyre, thanks to warmer air temperatures and more extensive summer melt north of Alaska and Siberia. Moreover, ice movement out of the Arctic through Fram Strait continued at a high rate despite the change in the AO. Thus warming conditions and wind patterns have been the main drivers of the steeper decline since the late 1990s. Sea ice may not be able to recover under the current persistently warm conditions, and a tipping point may have been passed where the Arctic will eventually be ice-free during at least part of the summer (Lindsay and Zhang 2005). Examination of the long-term satellite record dating back to 1979 and earlier records dating back to the 1950s indicate that spring melt seasons have started earlier and continued for a longer period throughout the year (Serreze et al. 2007). Even more disquieting, comparison of actual Arctic sea ice decline to IPCC AR4 projections show that observed ice loss is faster than any of the IPCC AR4 models have predicted (Stroeve et al. 2007).